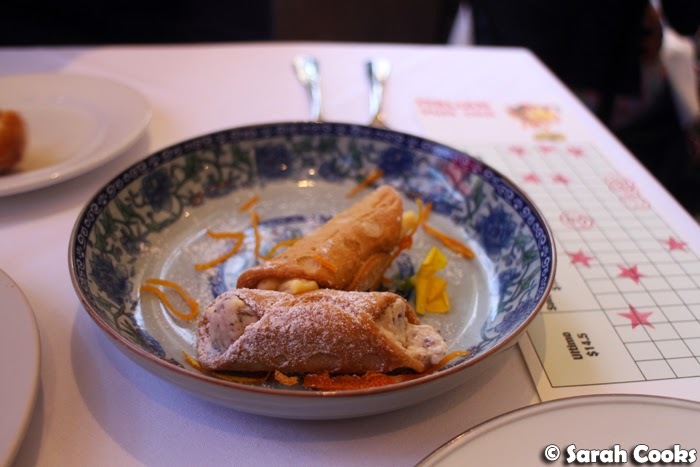 Last weekend I was invited to try Italian Yum Cha at The Grand Hotel in Richmond. Lately I've been trying to limit the number of invitations I accept, not only so that I don't overdo it with rich food and alcohol, but also to give myself some downtime, so that I have energy for family and friends, for work, the gym, and even for cleaning my flat (boring but necessary!) However, the prospect of Italian Yum Cha sounded to good to resist! 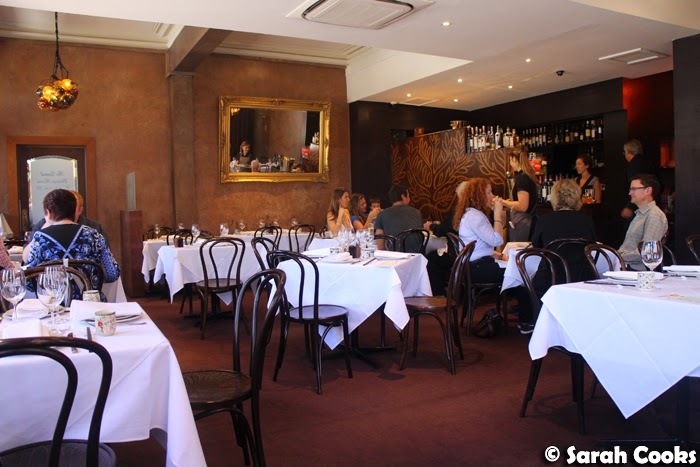 For the first four Saturday and Sunday lunches in November, The Grand is putting on an Italian Yum Cha (or "bere vino") as part of Good Food Month. 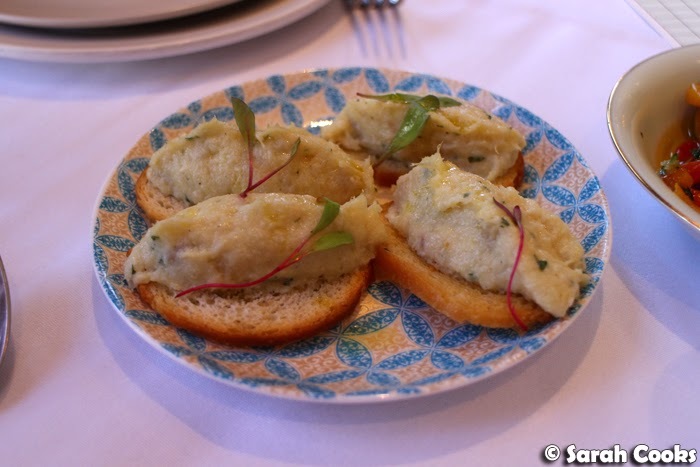 They've raided op shops for cute nonna-style crockery, borrowed a steamer trolley, and put together a fun menu of Italian bites to be served yum cha style in their dining room. 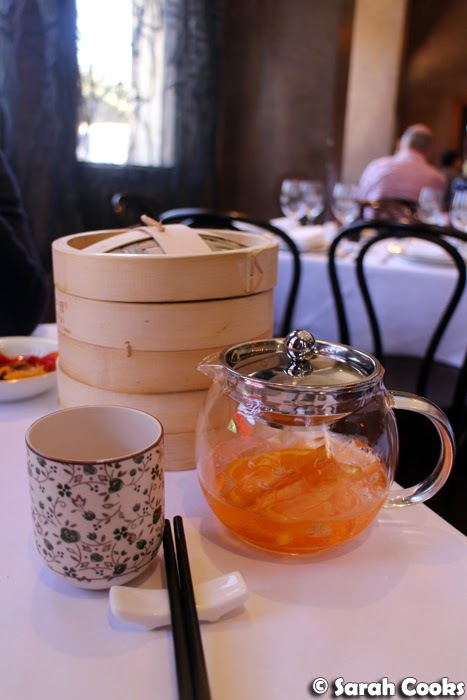 The yum cha started with a pot of Aperol spritz "ice tea", which was a complimentary inclusion for each table. It was low on alcohol, only slightly bitter and very refreshing - it tasted great and I thought it was a cute touch. So, how does it work? 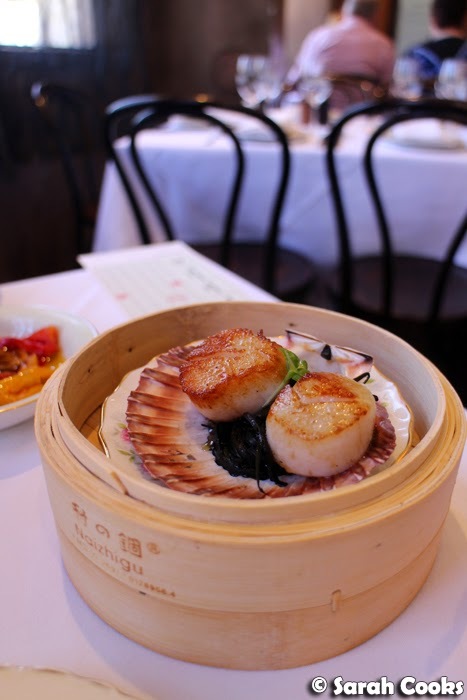 The Grand has created a special yum cha menu - the items come around on trays, but you can also order directly from the menu if you are decisive and don't want to wait! Like regular yum cha, food is charged on consumption. Individual items range from $6.50 to $14.50. The menu is huge, with sixty-three different items available - we did our very best, but only made it through a small selection of what was on offer. My suggestion is to try not to get overwhelmed by the friendly waitstaff and their trays of pretty, pretty food - don't simply accept everything you see (hard, I know! ), but have a good look at the menu and order anything that you definitely want to eat so that you don't run out of space before it comes around. Cobia is a very oily, rich fish (I've seen it called "Wagyu of the sea" before). Here it was served in generous slices, topped with more richness in the form of egg yolk and parmesan cheese, with freshness from pickled enoki mushrooms and cress. 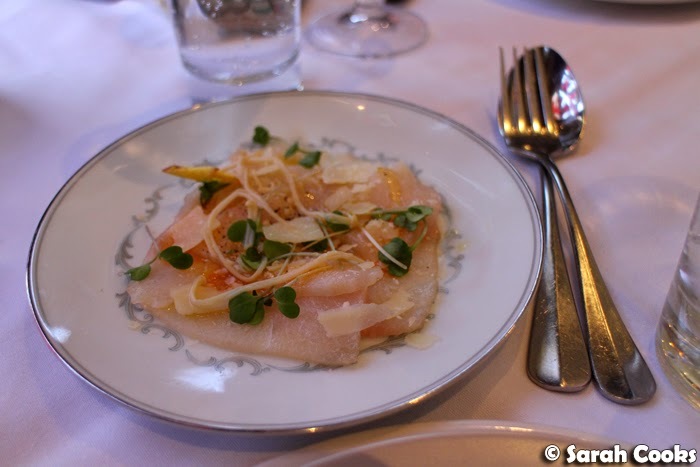 Normally I'd think to avoid cheese and fish, but the cobia was robust enough to match the parmesan. Yum. 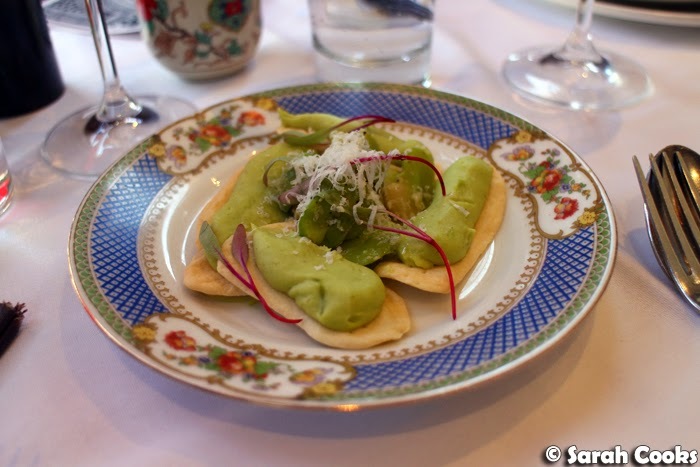 I can't not order a dish with broad beans - the broad bean and mint puree was light and summery, and I loved the the texture combo of fresh whole beans, smooth puree and crisp biscuit. The gnocchi came highly recommended by the waitstaff, but I was always going to order this anyway, because brown butter and sage are just The Best. 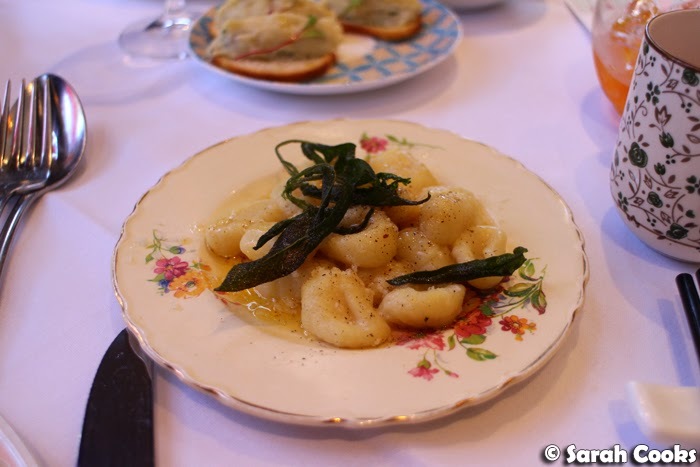 The gnocchi were nice and light, the crispy sage was delightful, and there was an oozy pool of nutty toasty brown butter. Heaven. 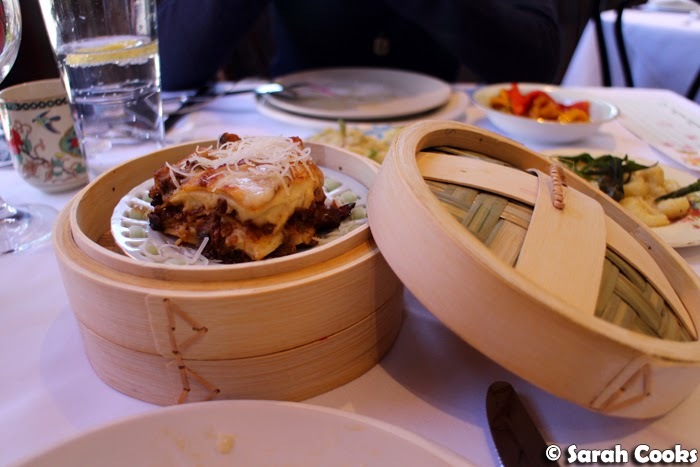 We didn't see the lasagne di cinghiale (wild boar lasagne) come around on trays, but I saw it on the menu and had to try it. I'm so glad we did, because it was great! It didn't taste too gamey, and had nice layers of creamy bechamel and rich tomato-boar sauce. The scallops were fresh, generously sized, and perfectly cooked - seared on the outside and just cooked within. The little nest of squid ink spaghettini was actually made of julienned zucchini strips (how paleo of us! ), which had a nice tender-crisp bite to them. The polpette di vitello (veal meatballs) were excellent! They were incredibly light and fluffy, and the tomato sauce was rich and delicious. I wish I could make meatballs like this at home! 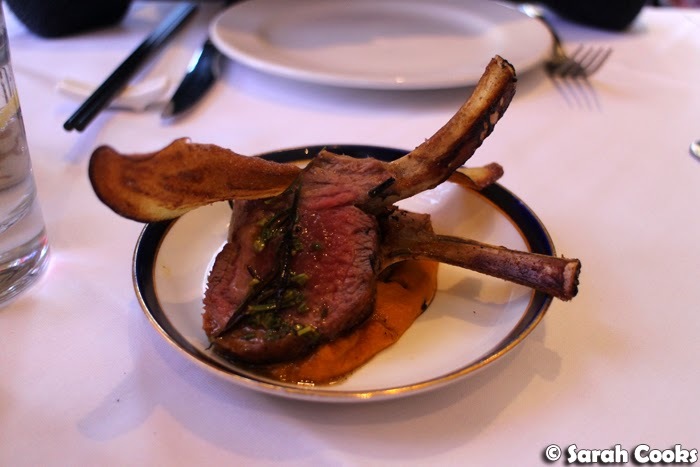 As you can imagine, we were very full by this stage, but we were told we simply had to try the lamb cutlets. These were cooked on the rare side of medium rare (perfect for me! ), were super tender and had a lovely salty crust on the outside. 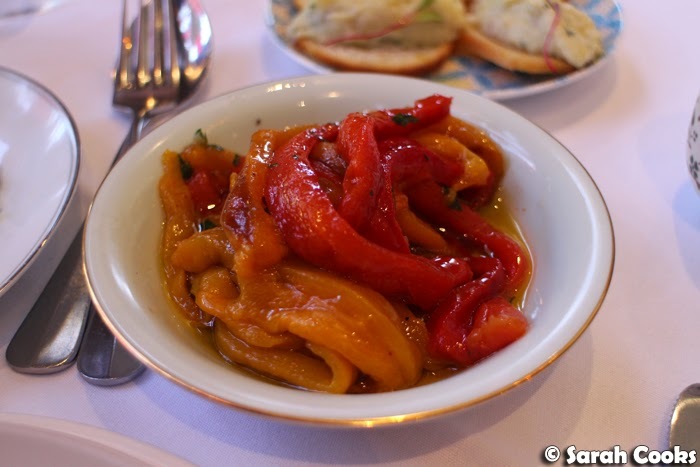 The slightly sweet burnt carrot puree and salty eggplant crisp were great complements. Order the lamb chops if you go! 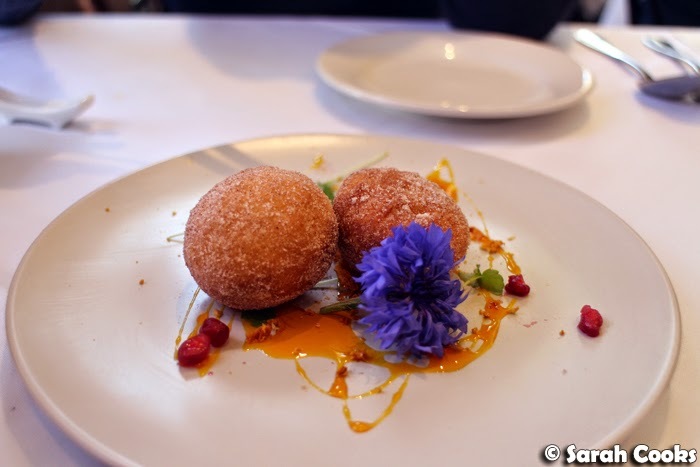 The bombolini, mini donuts filled with custard, were very nice. I don't think they really needed the fancy plate decorations - they were nice enough to stand up on their own. There were two flavours of cannoli - one plain and one chocolate - both were great, and impressively, didn't taste or feel greasy at all. Rather, they were light and crisp and all too easy to eat. 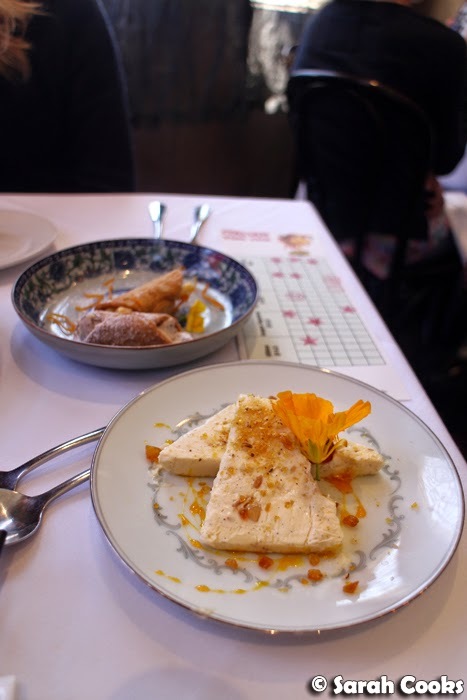 The best of the three desserts, however, was the nougat semifreddo. If you only have room for one dessert, I suggest this one! It was dense and creamy, with little crispy sweet pops of caramel and nougat throughout and generous flecks of vanilla seeds. Thanks to Barnie from The Grand for the invitation and to the team for a great lunch! 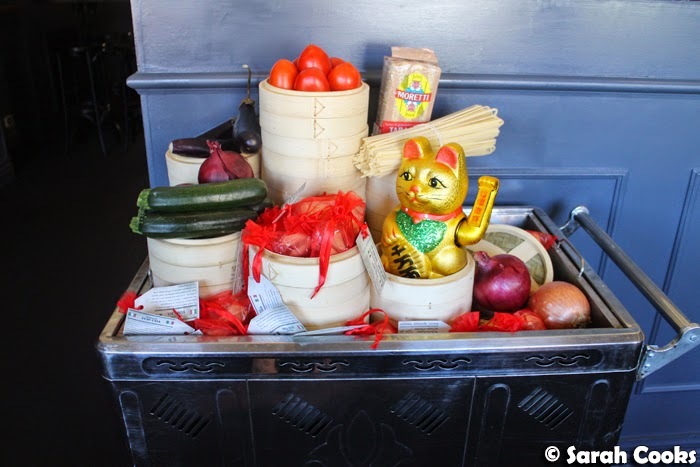 Based on the quality of the Yum Cha, I'd definitely want to go back to try their normal menu - lots of the yum cha items appear to be miniature versions of the dishes they serve in the Dining Room. Who's up for an indulgent dinner? Sarah and Sandra ate as guests of The Grand Dining Room. Those meatballs sound awesome! Italia yum cha sounds very intriguing, although I'm guessing it's not half as chaotic as the usual yum cha houses! 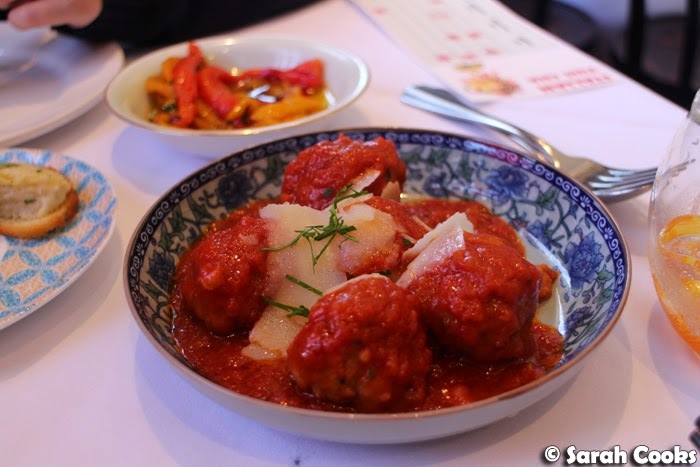 I love the idea of an Italian yum cha - I always think that other cuisines could really benefit from that bite-size type of eating that's so enjoyable at yum cha! The perfect way of enjoying tiny bites of everything.